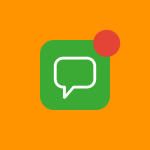 In one of his newest columns, LEAD-Author Matthias Mehner demonstrates how Messengers can be used for different communication objectives. He explains the usage and benefit of WhatsApp customer journey. The latest edition of W&V is a service-oriented dive into the world of Messenger Marketing. When I posted this article on my LinkedIn profile, the positive feedback was resounding, and included some thought-provoking comments. A question from Florian Hohenauer, Managing Director at Hotwire, was actually the inspiration for today’s column. 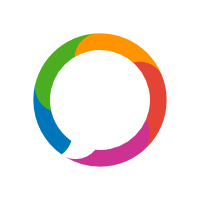 “Which communication objectives (Awareness, Knowledge, Consideration, Preference, Action, Advocacy) along the customer journey is WhatsApp suitable for?” – Florian Hohenauer, Hotwire. This was my short answer, and I’d like to follow up with this idea in more detail here. Nowadays, it’s advisable for companies to establish an authentic and direct relationship with the customer as soon as possible. Email is still widely used for this purpose, but it’s becoming more and more unattractive for both sides. For a long time, social media was considered to be the miracle cure for all things customer relations. 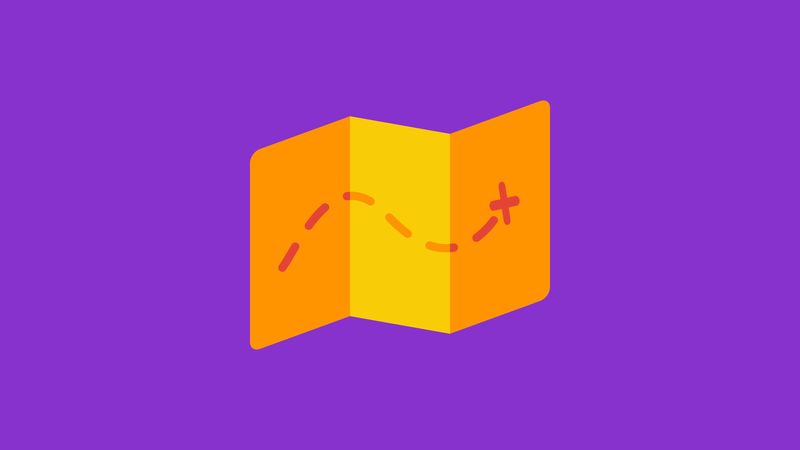 However, it has one huge, structural disadvantage: if an algorithm filters how you reach your fans and followers — or fail to reach them, which is now usually the case — then you can’t exactly speak of a direct relationship. Apps have also been considered effective in building customer relationships — but the only ones that seem to offer a lasting results are Facebook, Google Maps, or my banking app. The others are struggling to survive both in the App Store, and on my phone. The sad truth is: 77% of all apps are deleted within three days. WhatsApp, on the other hand, is almost never deleted, and has consistently dominated the rankings in Google and Apple App stores for years. Number of Downloads from the Google Play Store in Januar 2018 (in thousands). 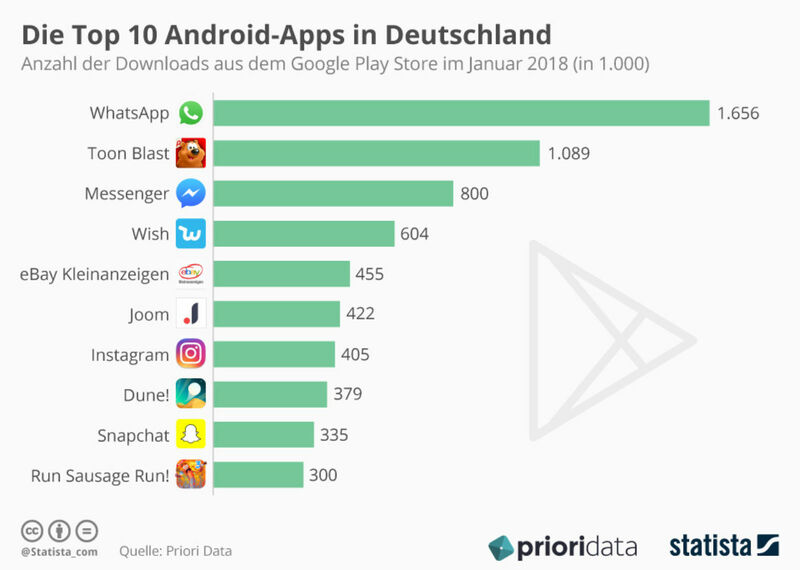 WhatsApp is the clear leader for Android Apps in Germany. Of course, if someone isn’t already familiar with my product or my business, then he won’t suddenly sign up for my WhatsApp service. However, more and more companies are placing their trust in this communication model, and are trying to use ads, social media, and their websites to turn their communication with clients into direct relationships as quickly as possible. This is a great business move. When I can offer content marketing on WhatsApp, then I can maintain and raise awareness for my products regularly, independently, without algorithms, and without further acquisition costs. JustSpices uses this method to pique my interest with delicious recipes sent over WhatsApp every week, and I have to admit — I wasn’t actively following spices before! As soon as I’ve connected with my target group via WhatsApp, I can go further than just building awareness. Daily news or best practice tips are an easy way to engage your customers by offering information and ideas, and building trust. For example, the DWS investment fund regularly sends me information about investment strategies and saving tips. These tips not only help me learn more, but they also reinforce my trust in the company’s specialized knowledge and competence. When I’m searching for a new investment fund, DWS will definitely be included in my short list. I’ve seen similar examples in the fashion, food, and home/living markets, which primarily use Messenger to inform and advise, rather than trying to sell directly over the app. WhatsApp also has a fast-growing role in internal communication and in the B2B sector. 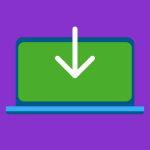 Distributors, business partners, and even company employees can keep up to date and receive personalized news about products or company information through WhatsApp. Our most successful customers are from E-commerce, and sell directly in WhatsApp. 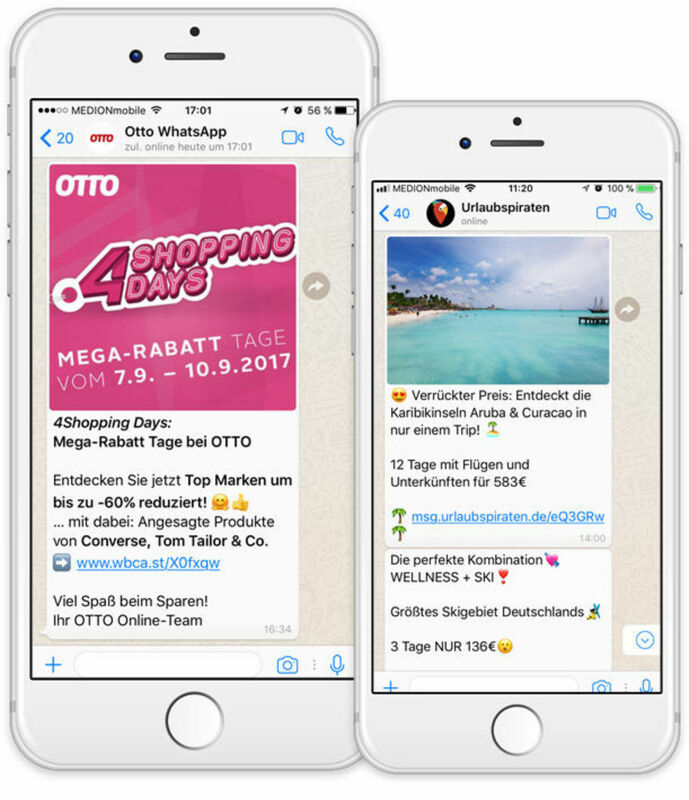 Services like “Deal of the Day” by OTTO or Messenger updates about fast-dropping travel prices by Holidaypirates can use the immediacy of Messenger communication as an effective sales strategy. One of our biggest customers, myDealz, actually froze the Amazon server recently by informing their subscribers about a coupon glitch. Customer Service via WhatsApp was the topic of an earlier LEAD column of mine. It’s simple: if all of my customers use WhatsApp for their personal communication, then it’s simply good business to use this channel, which they already know and trust, to offer my own services. Communication isn’t only necessary for sales! Many companies have started using WhatsApp for recruiting, and political parties and associations look to Messenger apps to provide information for their members or politically interested voters. 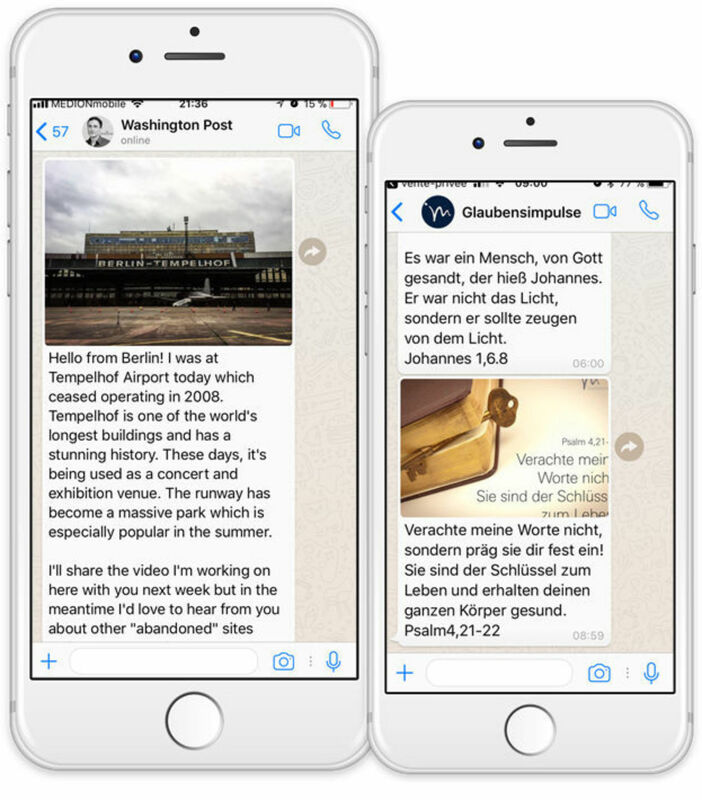 Cities and communities in Germany or Austria such as Augsburg, Rügen, and Vienna use WhatsApp and Co. for local information and events. Even media channels have taken a liking to the Messenger format, from smaller local weeklies, to popular daily newspapers, and even LEAD. 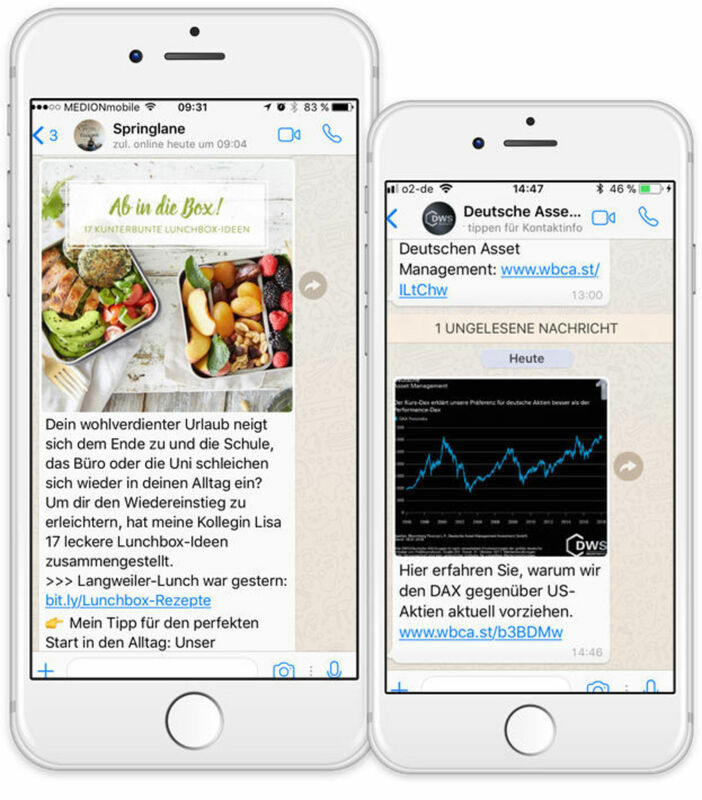 Online newspapers can use WhatsApp to spread news, generate website traffic, and enter into a dialogue with their readers. The Washington Post even recently received the “Golden Blogger Award” for their success in Messenger communication. 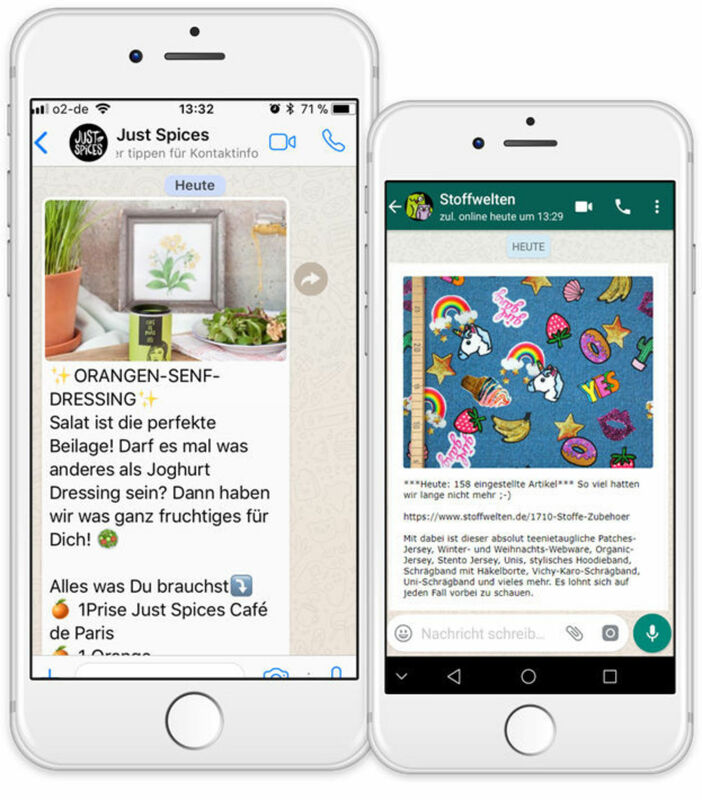 WhatsApp is currently the most loved communication channel in Germany, and in the future, it will definitely win prominence in the business-customer relationship. Companies that currently communicate with their clients over the phone, with SMS or email, or through social media, can do all of this over Messenger services — and can optimize the advantages of WhatsApp and Co. for all steps of the customer journey. Learn more about chatbots: 8 Chatbot Projects You Will Love to Discover!